Blu Boutique dress (c/o). Jeffrey Campbell shoes (c/o). Midas & Moros sunglasses (c/o). 8 Other Reasons earrings (c/o). I absolutely love this colorful Rorschachesque dress, and I love that the back is printed as well as the front. Statement garments that make it easy to accessorize are my most prized pieces, and wrapping up this 'fit with orange hues and gold metals was a snap. I'm wearing another fantastic piece of Midas & Moros eyewear artistry! 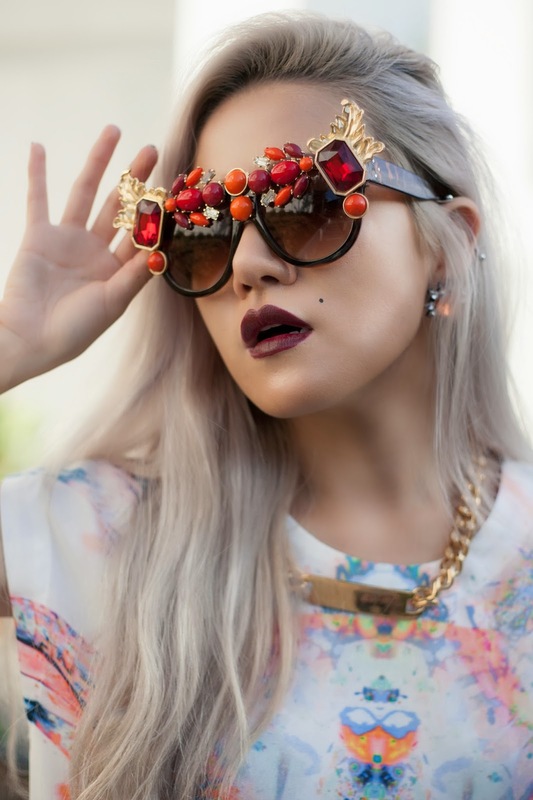 With phenomenal shades like these, it's hard to tell if you're styling around the outfit or the sunglasses. You look stunning. I love the dress! Gosh I love this style, it suits you well, the glasses are killers! Amazing look. Beautiful dress. Great photos.